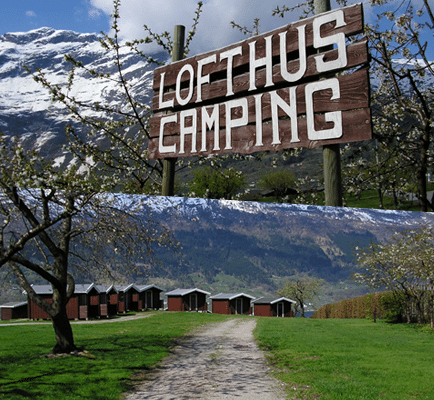 Lofthus Camping is situated amid lush orchards in the heart of Hardanger with views of the fjord, mountains and glaciers. With us you can really enjoy your holiday in peaceful and scenic surroundings. We are proud that three generations can welcome our guests. Do you wish to book or do you have any questions? Large familycabins, 64sqm, fully equipped with 2 bedrooms with space for a total of 6 people, large kitchen with all equipment, bathroom, washing maschine, TV, Wifi and a large terrace with dining area. Excellent view! These cabins can also be rented out of season, price on request. Dogs are not allowed in these cabins. 90 square meters on two floors. 2 bed rooms with total 8 beds, bathroom and kitchen department. Main room and bedroom. Large terrace with garden furniture. Bedroom with 4 beds. As 2-Bed Cabins, but larger. Standard, 1-room cabin with lighting, heating, cooking plate and refrigerator. Reservations via our booking page.